Many musicians have portrayed an image of being from the streets to their advantage across the years. However, outside of the entertainment industry, you can’t use street credentials to get by in the real world. But instead of letting that hinder you, you should embrace the benefits of being from the roads rather than letting it hold you back. There are a lot of young men from the roads with designer brands and expensive jewellery, but these people can’t just walk into an estate agent and buy a property. It’s not that they can’t afford it, but they can’t legally purchase it. They’ve got no working history. They’ve got no bank account. They’ve got nothing to show for themselves in a legal sense. They won’t even be allowed to rent a property, because to do that, you have to go through credit checks. How are you going to pass a credit check if you’ve never had a bank account before? I was having a conversation with one of my service users recently and he said doing his thing on the streets is the only way he knows how to survive and make money. I said look, ‘I’m not here to judge you. Yes, on the street level, you’ll get your credentials. You’ll drive a nice car, you’re wearing designer clothes, you got a nice watch. You’re going to be respected. 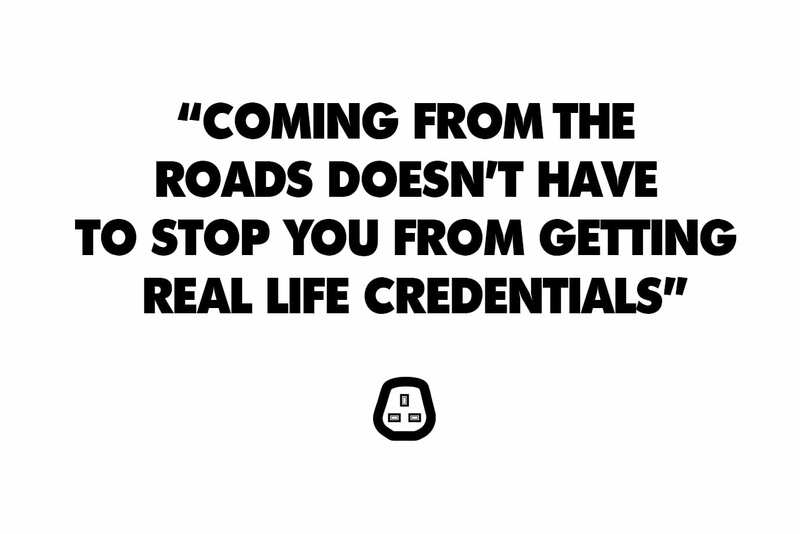 But when you step into the real world, you don’t have any credentials. Some man from the roads might look down on working as a cleaner, but a cleaner has more credentials than someone making their money on the roads. When you enter the real world and someone asks them ‘what do you do?’ they have no credentials to their name. Your watch and your clothes, it doesn’t matter in the real world, because you can’t prove you legally obtained it. They want to know ‘who are you and what do you contribute to society?’. ‘What do you do?’, that question there, will humble a lot of people when they actually give an honest answer. A cleaner has more credentials then a drug dealer, because a drug dealer has to lie about how they make their money. That’s what I try to explain to people I come across with my youth work, you need real life credentials. People from the roads go into certain situations regarding jobs and automatically think that we’re not liked. It’s not that we’re not liked, we’re not trusted. That spirit and charisma we have, some employers may like that. People that come from the roads are often more resilient than people who follow the straight and narrow. We’ve been experienced to hardships from a young age. A lot of people are only prepared for success. They’re not prepared for failure. They’re not prepared for the hardships of life, for example, the struggles of living in council estates, single parent households, living below the bread line, seeing poverty on a daily basis, mental health issues, all these sorts of things. Once someone from the roads has decided whole-heartedly, and I mean whole-heartedly, decide that they’re going to change their mind-set to stay crime free and earn a legit reason, you’ll find that these people tend to do well. When you actually want to make a change, you won’t make any excuses. Some people haven’t got any role model or blueprint to follow. We’re talking about generational issues, so they’re not expected to do better, and it’s sad, because a lot of them want to do better but don’t know where to look to for guidance, which creates a defeatist mentality. Don’t get me wrong, there’s some people that don’t want to make a change. They talk a good game, but deep down they like what they’re doing, but they know that it’s not cool to say it no more. It’s not cool to say ‘I like trappin’. Everyone has to make an excuse about why they’re trapping. ‘I’m trying to get my mum out the hood’ is one of them. Who’s mum is really out the hood?! Who’s ever got their mum out the hood? It’s not even that hard, to get your mum a cheap place if you’re saying your money is a decent as you say. But they’d rather go and buy Louboutin’s or Giuseppe’s’, so a lot of it’s now becoming about pull factors, rather than push factors. A lot of people just fake the struggle and they’re not trying to take themselves out of the struggle. My advice would be to always try and seek legitimate income. If you don’t know how to make a start in doing what you want to do, speak to people who have walked the path before you. See how they did it and try to put together to your own plan to get where you want to be. Think of something you enjoy doing, or if there’s nothing you enjoy passionately, an activity you wouldn’t mind doing in return for a decent salary. For example, if you want set yourself the target of becoming an estate agent or owning your own property company, look at what you’d have to do in order to become an estate agent, what skills are needed for the job and where you can get experience to help you take another step towards your goal. Rome wasn’t built in a day, but if you keep a positive attitude, you will be surprised with what you can achieve. In The Field is a column by Babz providing insight into the challenges young people in London face on a daily basis. Risk Manager at Pathwaze, youth worker, mentor and podcast host.